I’m happily reporting from my dormitory room, safe and sound and healthy with no injuries (beside minor bruises and common delayed onset muscle soreness) after… a SKI TRIP! 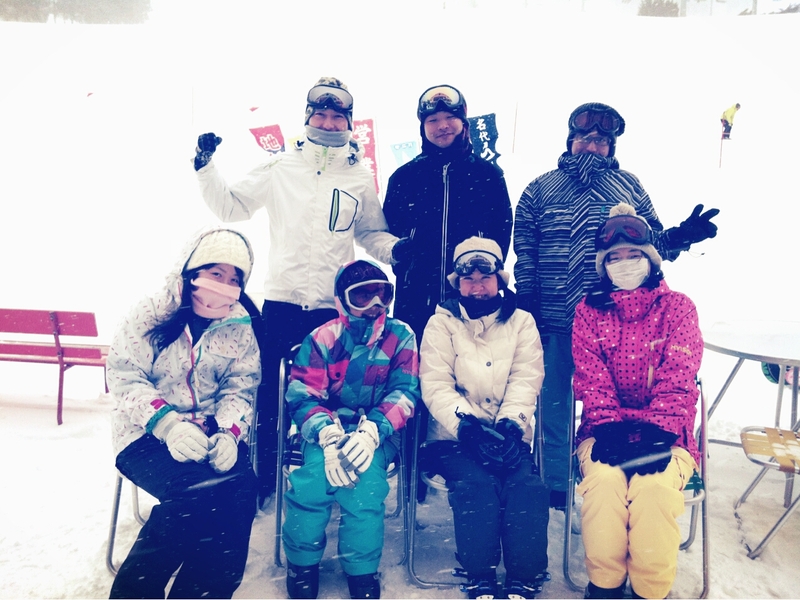 So, my wonderful laboratory 松田研究室 had just went to a ski trip to Naeba Ski Resort this thursday and friday (7-8 February 2013). Actually, i’ve heard some scary stories about ski and just for your information i am really absolutely not a sporty type of girl (in fact i am always flunking every sport and i have a lame strength, agility, dexterity, and anything you can named related to outdoor’s activity). But whatever, i’m at Japan, they have snow, my sensei agreed to teach me, my lab mates are very nice and they would not let me down, so i decided to follow this ski trip! Naeba is a mountainous area around Niigata Prefecture and Nagano Prefecture, in winter it is famous for its ski area. It’s quite close from Tokyo and by Shinkansen we can reach it only in 1,5 hour. Rice and water in Naeba is said to be one of the best so the omiyage from this area is mainly sake (rice wine). So we departed at 6.32 from Tokyo Station using Tanigawa Shinkansen to Echigoyuzawa Station. There were me, Masuda-san, Kawaguchi-san, Matsuda Sensei, Cao-san, and Sugiyama-san. Later on at Omiya Station, Yamamoto-san also joined. Actually, it was pretty much a struggle to get to Tokyo Station by 6.10. I had to walk from my dormitory from 4.50 to catch 5.10 train. But, i made it on time and we all ate breakfast on the train. 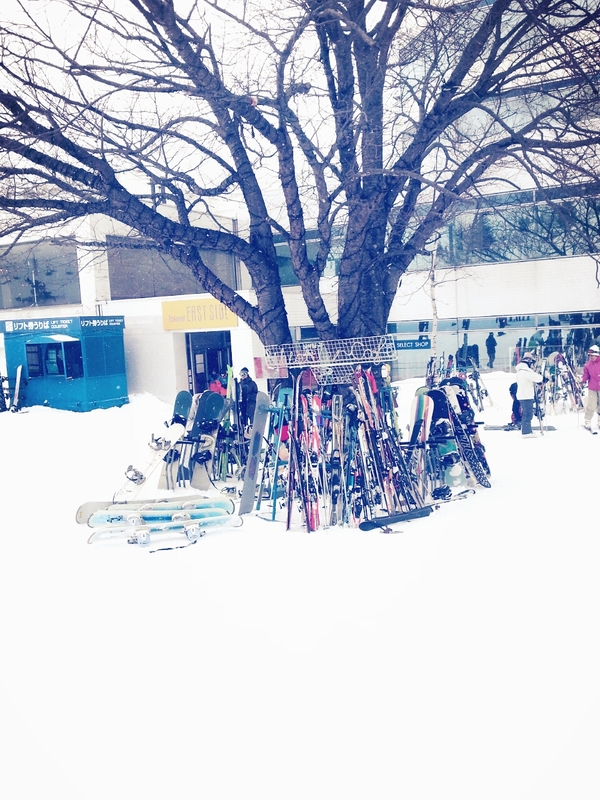 It only took 1,5 hour to reached Echigoyuzawa Station, the nearest station to the ski area. Just before we reached the station from the train’s window i could already see snow everywhere. Yes, it snowed the night before and everything were covered on a beautiful thick white blanket :’) When we reached the station it was really cold but the sun was shining very brightly. It was my first time to wear such a full gear winter clothing, from ear muffs, scarfs, until gloves :p at Tokyo it was never that cold. 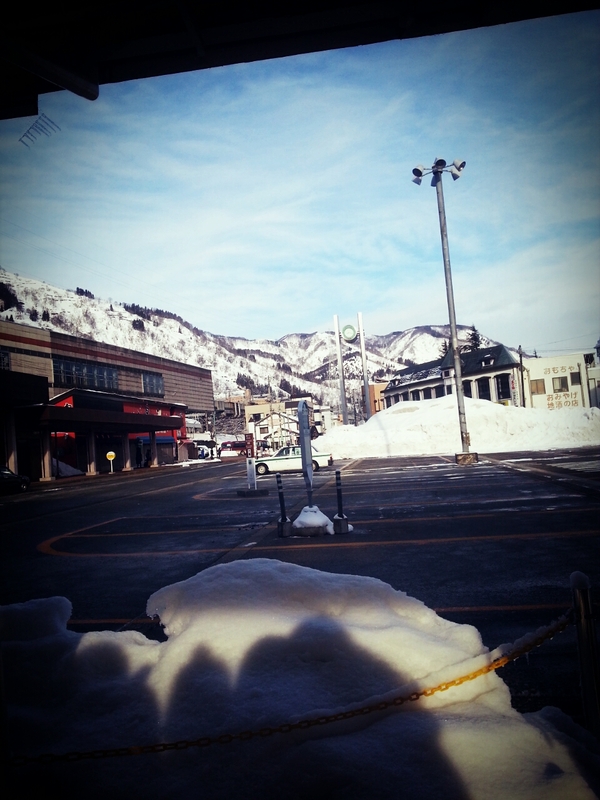 After we arrived at the station, we took a shuttle bus to Naeba Ski Resort. 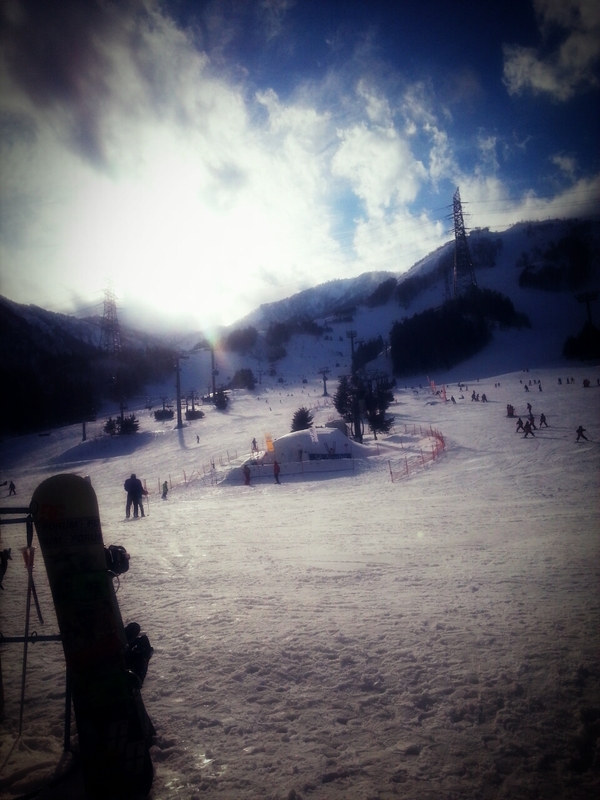 We gonna spent this ski trip at Naeba Prince Hotel and Ski Resort. So this gigantic resort hotel with 4 buildings connected to each other is located just in front of the スキじょう. And you have everything ready there, from ski gear rental area, ski school, ski gear shops, plenty of restaurants, two onsen (Japanese Public Bath, and one of it has an open air area), souvenir shops, and European styled room. Once we have arrived at the hotel we immediately rent the ski gear. From ski shoes, ski board and poles, ski wear, and goggles. We also had to wear woll hat and gloves. For the inside, we wore heat tech and sweater. I found out that the ski shoes is really the heaviest shoes i ever wear, ice-skating shoes is nothing compared to this heavy shoes. 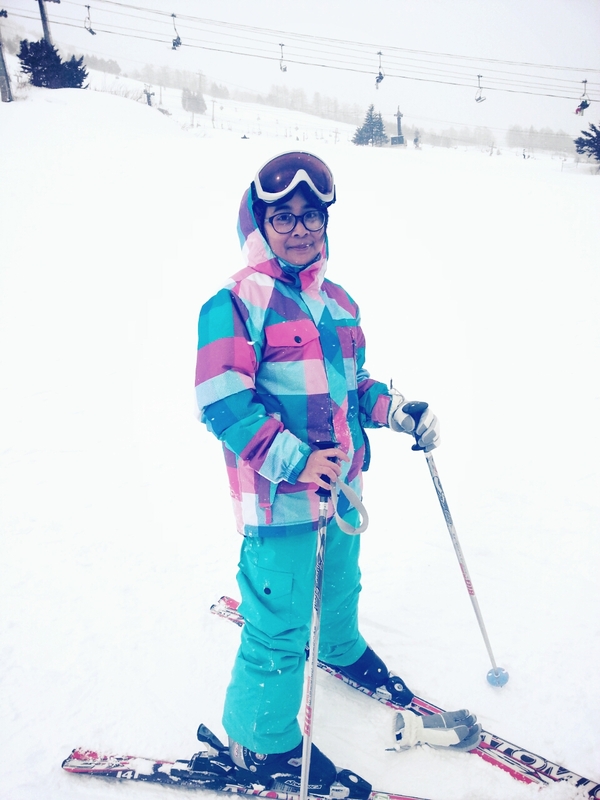 When i have fully dressed up with ski gear i had this uncomfortable feeling because only walking around with this heavy layered clothes and shoes is already tiring for me. 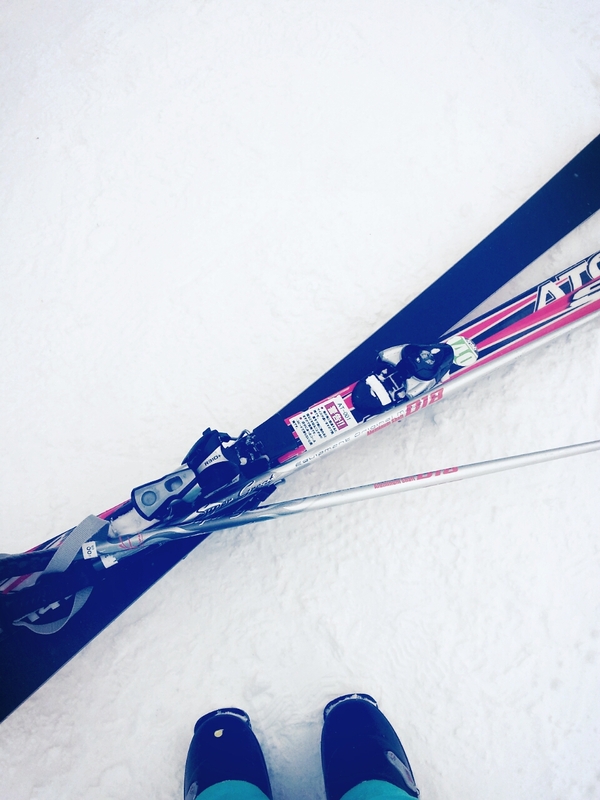 Can i really do ski? But anyway, i have no point of turning back. We went out and wow, i was really astonished! The view was amazing. And it was really bright the sun shines shined brightly and the white snow reflect the lights so much. So that’s why we have to wear goggle. The next thing i had to face is… the ski board which is really heavy (okay maybe this is a bit exaggerating but at least for me it is heavy) and even putting on the ski board to the ski shoes is difficult for me. And the degree of difficulty increased very much to walk with ski shoes and ski board. Now it was not only heavy but also slippery! So, what i learned today? I learned how to get up. So when you fall and you still have your ski on you. At first you have to bring your ski together to one side and use your pole to help you stand up. 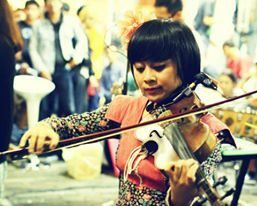 Just like this picture. 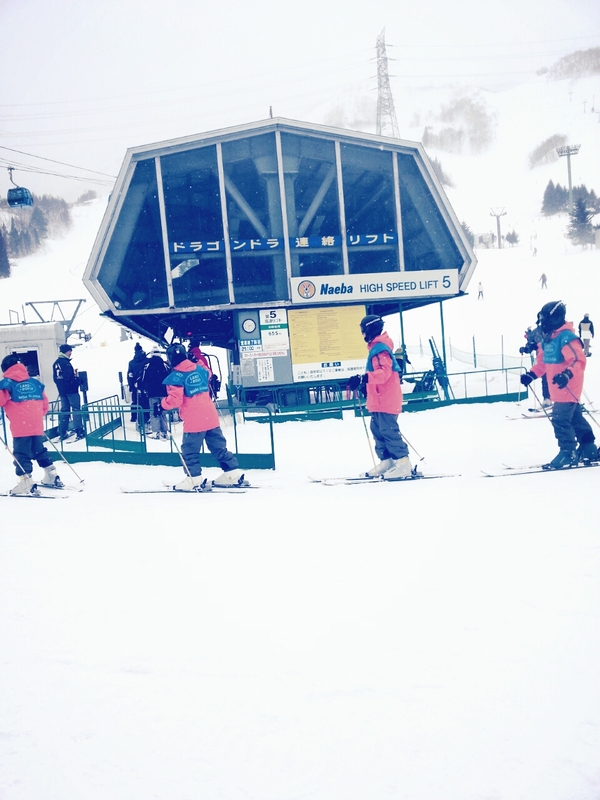 The second day, snow was falling quite hard, but everyone decided to keep on skiing. It was really cold. And sensei took me to practice downhill because she was afraid of losing me in this little snow blizzard. So she taught me how to stop properly. I think this is the most important aspect of skiing, how to stop. Because actually when you are skiing downhill you will just move and even gaining speed, so you have to be able to stop, in case you gain speed to much, or someone is in front of you or a tree is in front of you. And when i checked on the internet just now, actually she was teaching me how to do snowplough turn, a beginner technique. So when you are skiing downhill you have to make your ski parallel to each other and push with your pole. 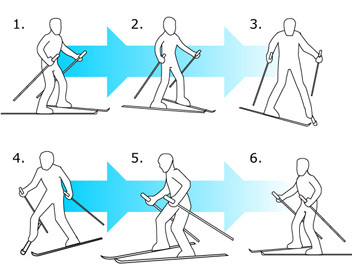 To stop, you have to bring the front of your skis together and the tails pushed wide away. Your knees should be put together also and you have to rolled it inward. After lunch everyone brought me uphill again and this time during steep slope i hold on to sensei’s back while she skii downhill. I really appreciated her dedication to teach me and it really reminds me of how my Mom used to teach me swimming. And anyway, i’m really thankful to her and i bet she could be a real ski instructor :’) And during not so steep slope i tried to ski downhill by myself. Finally i can write again. Well since weeks before it was chaos (hectic experiment at the lab, progress report, several final reports, and Japanese language examination) i did not have the chance to write anything at this blog. But now everything has loosen up a bit. I have finished all of my final reports, examination, and my laboratory work is not as hectic as several weeks ago. Well, i still have to come everyday, but basically i didn’t do as much. And i’m also currently waiting for my mutagenesis kit to arrive, so i can only practice Polymerase Chain Reaction, and do some validation on my screening methods. 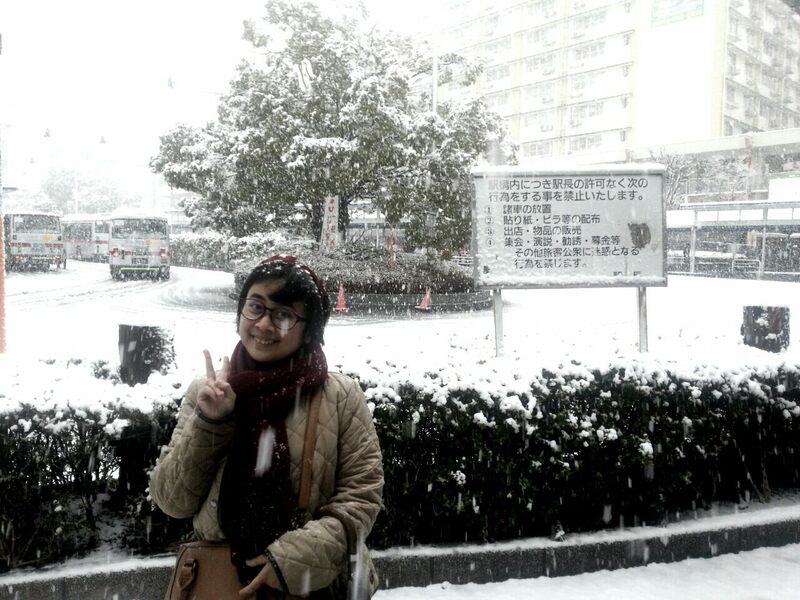 So, at 15th of January 2013, Tokyo experienced a heavy snowfall. It was public holiday, Coming of The Age Day (The day when youth that has passed 20 years old is considered fully an adult). At first i thought it would be just raining (because Weather Channel said so) but approximately at 10 AM it began to snow. Usually Tokyo doesn’t experienced such a heavy snowfall, so i just thought casually that the snow would stop immediately and would not pile up much and no problem would be caused. 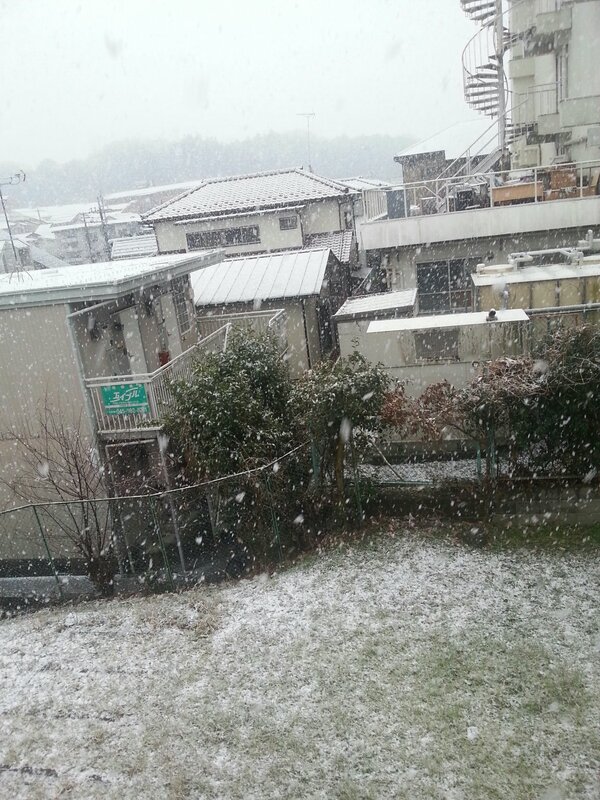 It was so beautiful to saw the snow began!to pilled up on my dormitory’s backyard. And i was so thrilled! So i accompanied my friend to buy the present and i also bought myself a hat at passage mignon to protect my head because after this i still had to venture to the lab. 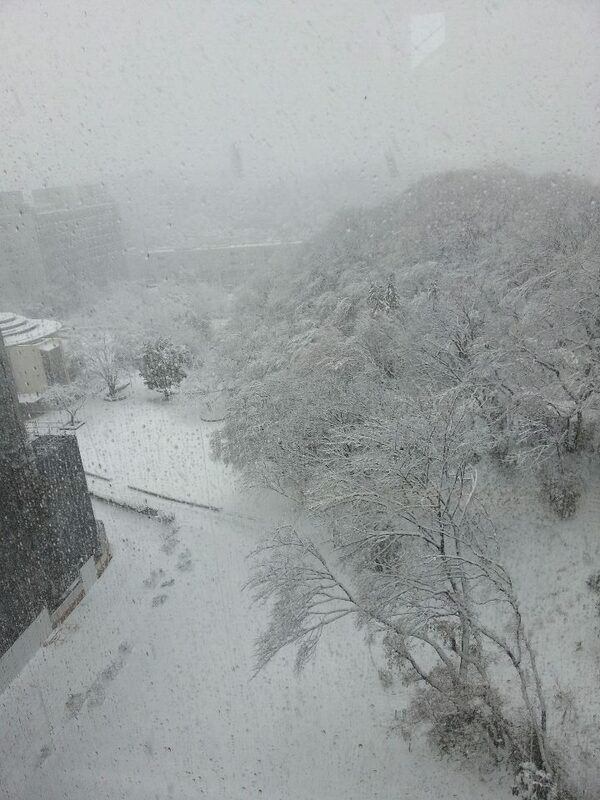 the view from my lab building, Suzukakedai Campus had became a snowy hill!!! By the time i reached Fujigaoka Station, the snow there had changed into rain and the snow pilling up has melt a bit. So it became much more slippery to walk on >.< I did not know how, i finally reached my dormitory again. But for me, the worst part was the next morning. The snow had became an ice, and it was extremely slippery. No one had clean the road yet nor the pedestrian walkway. And i really wish i didn’t have to go to the lab, do my progress presentation, attend lectures and special lectures that day!! Actually this is not my first experience of heavy snowfall. 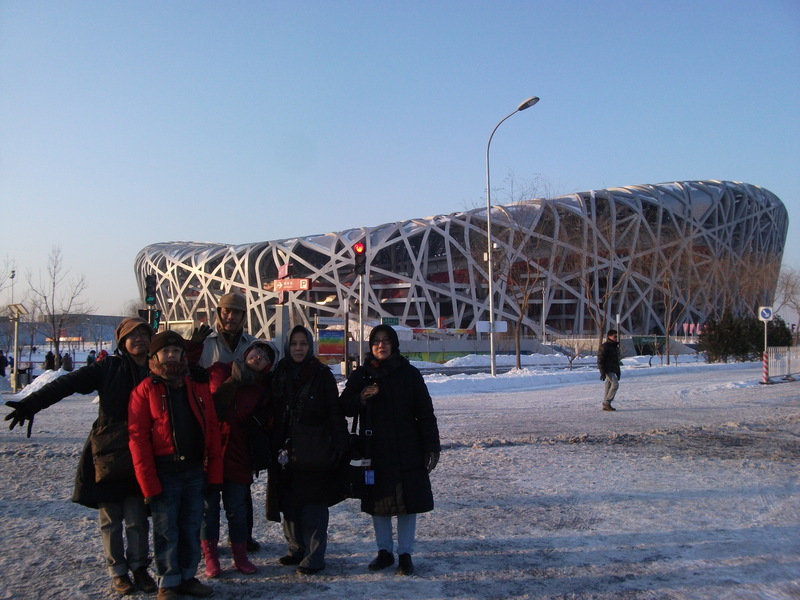 I had experienced once at January 2013 at Beijing, China. On the night when my plane landed at Beijing Airport, a heavy snow fall had just finished falling. And the temperature plummet until -16 degree. Even inside the airport it was freezing cold. But the next morning, everything had came back to normal, snow covering walkways had been clean up and there was no big problem. The Bird Nest Stadium and Snow! 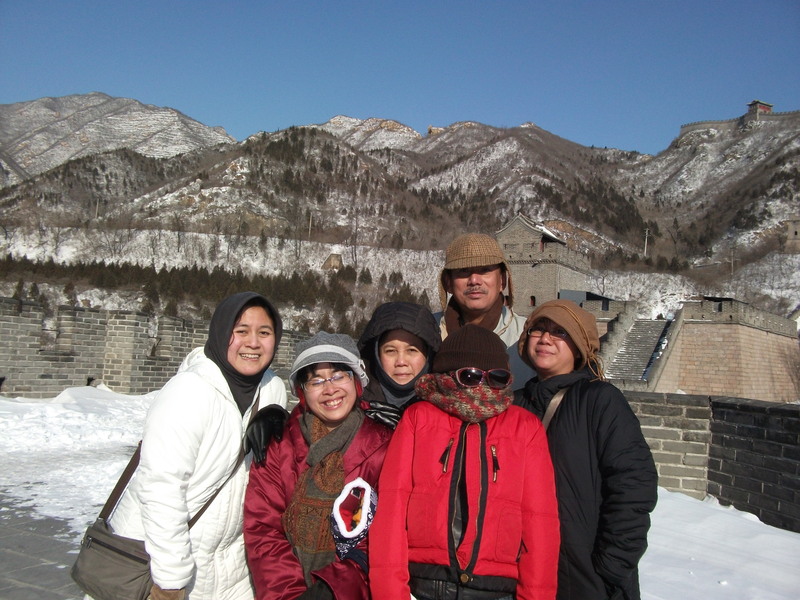 In the next morning even I went to The Great Wall of China although it was freezing cold, there were no slippery walkways because everything had been neatly cleaned up. In this way, i think Beijing had a better preparation to deal with snow than Tokyo and Yokohama, but i think no one can blame Tokyo and Yokohama government for this. Because we all know that Tokyo rarely experience heavy snow, and Beijing always experience that every year.